Investing in our success. Securing our future. Because we as producers have the power to define how our Check-Off program works, we are investing in our success. A check-off program is composed of producers, funded by producers and managed for producers. Check-off organizations coordinate efforts and increase demand of commodity products. Apart from setting up a common-sense legal framework, government primarily acts as a referee – ensuring we all play by the rules, don’t cheat or take unfair advantage. 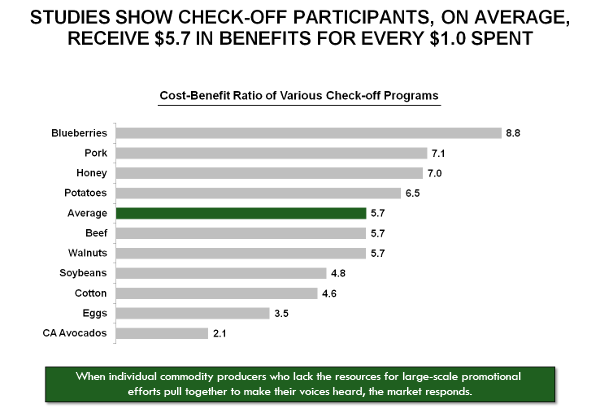 Check-off programs were designed by producers who believed they could only be effective advocates for their commodity if they joined together to make their combined voices heard in today’s competitive marketplace. And they asked government to act as an impartial arbitrator to keep every producer mindful of their self-imposed boundaries. Because producers have the power to define how our check-off program works – raising funds, administering our program, educating the public, promoting our products, seizing market opportunities – ready-mixed producers can take control of securing the future of our industry. Clearly, the results other check-off programs have produced show us that this initiative can deliver a healthy return on our investment.